By 2030, 60 percent of the world’s population is expected to live in mega cities. Technology has the power to help people live in communities that are more responsive to their needs and that can actually improve their lives. The concept of “smart cities,” which employs the Internet of Things (IoT) technologies such as connected sensors, meters and lights to collect and analyse data to improve public infrastructure and services, is set to dramatically change the way citizens live, work and get around. 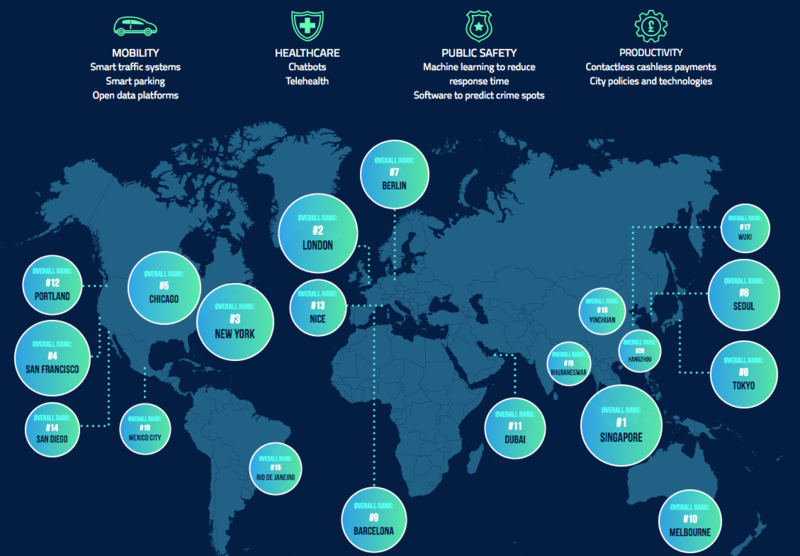 Major cities from around the world have been ranked across 4 key factors in technology: mobility, healthcare, public safety and productivity, with the goal of evaluating how they might deliver positive citizen outcomes in terms of improving quality of life. The study revealed that Singapore, Chicago, London, New York and San Francisco are the world’s leading cities integrating IoT technologies and connected services. These cities stand out because of their efforts to connect city municipalities, businesses and their citizens to address a growing need to improve “liveability” – specifically around mobility (San Francisco and Singapore), public safety (Chicago, New York, and Singapore), healthcare (London and Singapore), and productivity (Chicago, London, and Singapore) – as they transition to a smarter, more connected environment. View our interactive map here to see which cities are adopting smart city technology and leading the way in giving time back to its citizens. Smart cities have the potential to ‘give back’ each city dweller three working weeks’ worth of time every year. Free time is a scarce commodity in the modern world and has a powerful impact on an individual’s ability to reduce stress, and maintain happiness and health. Which city will be next to adopt smart city technology?